Welcome to Raccoon Lake, also called CeCil M. Harden Lake, a great place to visit and a great place to live. It is located in Parke County, Indiana about 50 miles straight west of Indianapolis. The area is hilly and wooded. The lake water is clean and warm in the summer. You can speed boat and ski in some areas or enjoy the quiet. 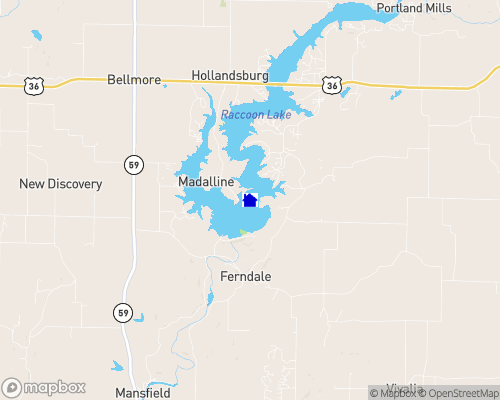 Raccoon Lake also offers great fishing and is the home of several bass tournaments. Also check out the listings on Rocky Fork Lake which is 8 minutes south of Raccoon Lake. Raccoon Lake is intimate and inviting, occupying 2,110 square acres of space. The area surrounding the lake is well known for its spectacular seasonal foliage and colors, and the local forests grow thick with hickory, oak, maple, and walnut trees. Anglers of all skill levels rejoice in such stunning panoramas as they take to the water for a productive day of fishing, confident that even better finds lie just below the lake’s surface! You can expect to find largemouth, smallmouth, striped, and white bass in abundance, along with walleye, catfish, crappie, and bluegill. And if you’re lucky and make it to the water in time for trout season, you’ll be rewarded tenfold! The Raccoon State Recreation Area joins the lake and provides countless recreation facilities and services. Feel free to either rent a boat or bring your own, launching it from any of the public boat ramps. Similarly, swim to your heart’s content before sprawling out on a towel along Raccoon Lake’s 35 miles of beach. Lake homes for sale are also granted access to several hiking trails, campsites, horseshoe pits, volleyball courts, and an honest to goodness archery range. With so much to do on and off the water, you’re free to pack your days as full or free of adventures as you like! Besides being the proud host of Raccoon Lake, Parke County is also the official “Covered Bridge Capital of America.” Thirty-five historical covered bridges are situated around the county, dating from 1865 to 1921. Head out from your lakefront property and make a fun day trip of searching out these iconic pieces of Indiana history. Plan another day around the pursuit of your next hole-in-one at any local golf course. Stretch your legs and test your swing at such courses as Raccoon Lake, Parke County, Matthews Park, and Geneva Hills to name a few. If you’re interested in living on a Raccoon Lake golf course, check out Golf Course Homes in Indiana on GolfHomes.com for property listings and details. Spend some time in neighboring Rockville, Indiana, for a taste of local history and culture. Billie Creek Village hosts one of the nation’s finest Civil War reenactments, and the Bridgeton Grist Mill offers an awe-inspiring view of the water. Relax, recoup, and rejoice in mellow days and great adventures on Raccoon Lake today! Raccoon offers great fishing and is the home of several bass tournaments. The Indiana Department of Natural Resources maintains and operates Raccoon State Recreation Area, five boat launching ramps as well as providing wildlife management, interpretive/recreation and shoreline management programs for the entire project. The staff at Raccoon state Recreation area is available to assist you with a wide range of services. The US Army Corps of Engineers maintains an office at the operations area at the dam. Management at the CORPS is responsible for the water level, land based use permits and licenses, such as stairways, seawalls vegetation alteration, rip-rap, foot paths, electric lines, and water withdrawal structures on Federal Property. Raccoon Lake is a fun and function lake. It's function is to control flooding and it provides "fun" with its numerous recreational opportunities. Raccoon State Recreation Area provides visitors with year round camping (modern to primitive), boating, hiking trails, bird watching, swimming beach, boat rental and a marina. Raccoon also offers 220 acres of managed public, hunting area as well as waterfowl opportunities while in season. The lake has 42 miles of shoreline, 2,110 surface acres of water. The lake is 62 feet deep at summer pool (winter 40'). Each year over one million visitors make their journey to Raccoon Lake. Raccoon Lake is a flood control lake. When too much rain comes in our area we hold the water and slowly let it out. It was built to keep the farm lands and small towns from flooding. Typically the water is only held for 2 weeks then slowly released. If more rain were to come, the water would go out an emergency spillway; no homes get flooded when the lake is high. All homes around Raccoon Lake can only be built on land above the flood level as carefully determined by the engineers when the lake was designed and built. The water is lowered in the winter time. Water remains in the lake for the fish, but it pulls away from the shoreline. This lowering of the water level starts the end of November and comes back up mid spring (depending on rainfall). History The construction of Raccoon Lake began in 1956, and was completed in 1960. It is a flood control lake created to control the drainage of Big Raccoon Creek as it empties into the Wabash River. Raccoon Lake is located in both Parke and Putnam Counties. It is operated by the Indiana Department of Natural Resources, under a lease arrangement with the US Army Corps of Engineers. Throughout the sixty's and early seventy's, it was known as Mansfield Reservoir. As time passed and community grew, Mansfield Reservoir was renamed, Cecil M. Harden Lake on Dec. 14, 1974, by President Gerald Ford. Mrs. Cecil Murray Harden has long been recognized as one of the most active members of the community and very instrumental in obtaining funding for the flood control project. Mrs. Harden served 5 terms as a U.S. Congressional Representative beginning in 1949. Sometimes it can be confusing to know the correct name for this lake. Some call it Raccoon Lake, others call it Cecil M. Harden Lake, Mansfield Lake, Raccoon State Park, or Raccoon State Recreation Area.. The most popular name is Raccoon Lake. Raccoon Lake is located in Parke County which is known for its many festivals.